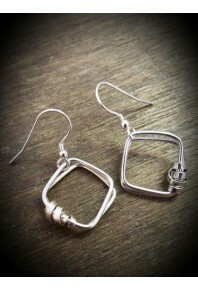 A striking Sterling Silver wire collection, hand formed square shapes achieve this desirable yet quirky effect! 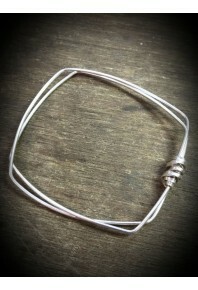 A very unique quare silver bangle made with 2mm wire and wrapped around with 1.5 mm flattened silver.. 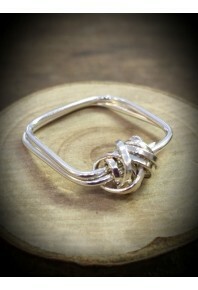 The striking silver 2cm square ring is made with 1.5mm silver round wire and wrapped around with 1.2.. 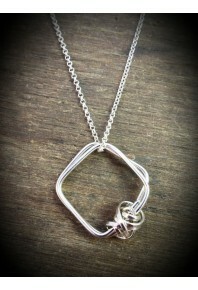 This stunning silver 2 cm square pendant made with 1.5 mm wire and wrapped around with 1.2mm flatten..
A pair of square silver earrings made with 1.5mm silver wire wrapped with 1,2mm flattened silver wir..
A pair of silver 1.4 cm square earrings made with 1.2mm silver round wire and wrapped around with fl..